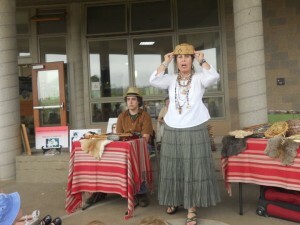 Native Talk’s storytelling presentations include traditional and original native California tales. Through stories of Coyote, Rattlesnake, Turtle, Cricket, ‘Ìswut and others, Cathleen presents an engaging and educational lesson on native California history and culture. The stories are thought provoking, stimulate discussion, and promote literacy skills across the curriculum. Each presentation is unique and the carefully selected stories integrate with the classroom unit of study. Storytelling is a powerful teaching tool, as our ancestors knew. 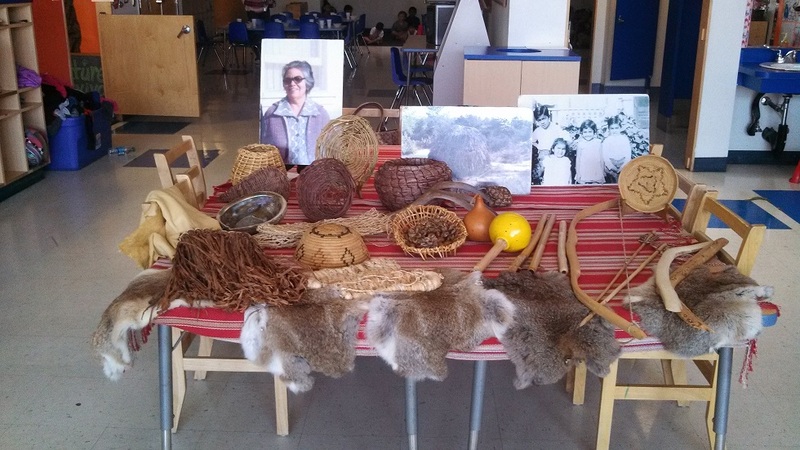 One of the main elements of the presentation is a table display of museum quality, native made items from every day life pre-contact from Cathleen’s collection. The items include: tools, a variety of baskets, a willow bark skirt, bow and arrows, r abbit sticks, yucca sandals, games, musical instruments, fish trap, shells, rabbit furs, deer skin, gourds, acorn, yucca fiber, a bundle each of juncus and deergrass. Also displayed are enlarged vintage photos of Cathleen’s family across the generations; illustrating that native people are still here, living and working in the local community. The presentation begins with Cathleen greeting the audience in the Luiseño language. The table display illustrates the daily life of Southern California native people in the early days and sets the scene for the stories. The students are able to handle some of the items from the display; including a tactile experience in the learning process. The presentation integrates the display items and the stories; each making the other more meaningful. When schedules permit, Brandon Wallace performs native flute music to accompany the stories. The goals of NATIVE TALK have remained the same since 2002: To present accurate native California history with an emphasis on the San Diego area, to promote awareness of local native culture and traditions, to impress upon the teachers and students that we are still here, and to meet a variety of State Standards across the curriculum. Ideally, each presentation is 55-60 minutes long, however, it can be planned to fit any schedule or venue. The program includes 3-5 stories and there is time for questions at the end of the session. In addition to schools, NATIVE TALK is enjoyed at nature centers, museums, scout meetings, youth groups, historic sites, garden clubs, and anywhere people appreciate local native history and storytelling. 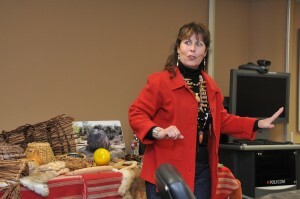 NATIVE TALK’S presentations promote cultural awareness and preservation. Storytelling speaks to the heart and soul, gently teaching and guiding. Presentation fees vary. Contact Cathleen for scheduling and fee information.